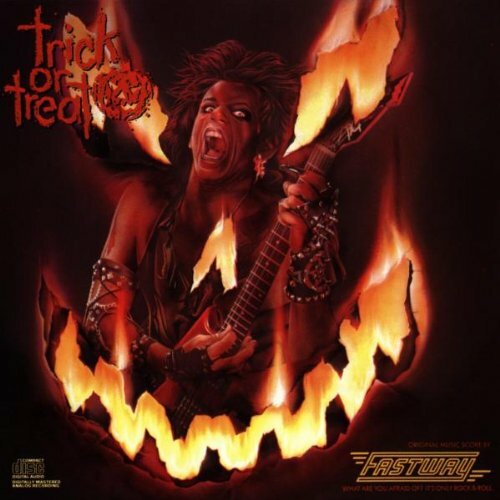 Hall of the Mountain King: Still Spinning: Fastway, "Trick or Treat Original Soundtrack"
Still Spinning: Fastway, "Trick or Treat Original Soundtrack"
When I was in junior high, I thought Trick or Treat just might be one of the greatest movies ever. I’d stay up to watch it in the wee hours on MTV, and on the rare occasion that I had a chance to rent a movie to watch by myself, it was often my choice. I even wrote a sequel to it at one point that, of course, featured a kid who totally wasn’t me in the lead role. The movie tells the story of rocker Sammi Curr, who has died in a hotel fire, but his restless spirit has a plan to return to life during the playing of his unreleased album at midnight on Halloween. It features some pretty bad acting by Gene Simmons as the DJ who plans to play the album, and a hilarious but equally bad cameo by Ozzy Osbourne as a TV preacher. When I came across the movie in a bargain bin a few years ago, I picked it up, thinking I’d relive my youth — and to be kind, I didn’t enjoy it nearly as much. I guess, perhaps, I’m a little more distant from that kid than I thought. While it could conceivably serve as a decent bit of satire about the times, I don’t think the filmmakers intended it that way. Campy nostalgia aside, one thing about the movie remains outstanding all these years later — the Fastway soundtrack. The British band was originally formed by Motorhead guitarist “Fast” Eddie Clark and UFO bassist Pete Way (hence the name), though Way never recorded with them due to contractual issues. Fastway scored a minor hit with “Say What You Will” in 1983, but never really got a lot of widespread attention. Trick or Treat proves, at least to me, that Fastway deserved much more. The album features a collection of hook-laden hard rock tunes that are firmly rooted in the sound of the mid-1980s, but also are given a little bit of classic-rock backbone. The album opens with the title track, a song that always puts me in mind of Quiet Riot’s better work. You’ve got some big guitar chords from “Fast” Eddie Clark with a tough drum beat underneath from Alan Connor. Then comes that big, throw-a-fist-in-the-air chorus. I’m instantly transported back about 30 years, banging my head and singing along, particularly when Fastway vocalist Dave King lets out that Kevin Dubrow-like final line that solidifies the Quiet Riot comparison. It’s a formula Fastway follows again on “After Midnight,” which features some AC/DC undertones and another absolutely irresistible chorus for an old ’80s rocker like me. “Get Tough,” another tune with that same pattern, was always a favorite of mine. It played on the fantasy that a lot of kids probably had at one point or another about finally standing up and telling the bullies and people who put you down to go to hell. Even now, there’s a certain chest-thumping feeling that comes over me when I sing along with a chorus telling me it’s time to get tough because this boy’s had enough. The same theme runs through “Stand Up,” though not as forcefully. Fastway’s 1970s roots really come out on “Hold on to the Night,” a driving classic rocker with a rhythm section that puts me in mind of “Radar Love.” Unfortunately, it’s one of the weaker tracks on the record and doesn’t have the stick-with-you hooks of some of the other tunes. Being a 1980s hard rock album, it had to have its softer moments, too, though Trick or Treat lacked a true ballad. “Don’t Stop the Fight” is the quintessential 1980s semi-ballad. You know the one – where the band wanted to do something a little more heartfelt, but didn’t want to alienate the largely male teen fans that wanted heavy guitars. Despite that, it’s a pretty good song, if a bit dated now. Of course, that could be said of most of the record. Fastway’s album closer “If You Could See,” which comes a little closer to being a ballad, doesn’t fare quite as well, but it’s still not a bad tune. Certainly, this album reflects the era in which it was recorded, just as much as the movie it came from. That said, the songs Fastway’s Trick or Treat hold up a little better for me than some other recordings from that time period. Whether it’s from the very personal connection that I had with it at the time or if it’s actually better than those other records, it’s hard to say. If you’re a hard rock fan looking for something to add to your Halloween celebration, I’d probably pass on the movie, but there are definitely a few Fastway songs here that are worth working into the mix.